Entering June with zero commitments from the 2019 recruiting class, Pitt’s football team found itself stuck with a late start to its recruiting trail. But despite the slow start, the pace suddenly changed as the the count rocketed to 11 commits in just one weekend, with nine of those players verbally committing on Father’s Day — and one commit late Tuesday night. The incoming recruits started with Florida linebacker Leslie Smith’s commitment June 10. Smith’s commitment to the program stood alone for about a week, until Travis Koontz kicked off a surge of verbal commitments to the Pitt coaching staff June 16. Following Koontz on Father’s Day were Brandon Hill, Brandon Mack, Bryce Nelms, Deandre Jules, Davis Beville, Vincent Davis, Calijah Kancey, Brandon George and Khadry Jackson — and Bam Brima joined the 2019 class late last night after it seemed like the week’s flurry was over. With the addition of these 11 three-star prospects, Pitt now sits at No. 8 in 247Sports’ ACC Football Recruiting Composite Team rankings with a score of 193.19. The 6-foot linebacker from Miami Northwestern High School accepted Pitt’s offer over 17 others from schools such as Colorado State, Dartmouth and Temple. In his junior season, Smith had 90 total tackles, with 52 solo tackles and 10.5 sacks. With the addition of Smith, the team has amassed 12 linebackers for the upcoming season. A native of Youngstown, Ohio, Koontz spent last season playing at Los Angeles Pierce College before transfering to Ventura College. Last season, the 6-foot-5 tight end caught 11 passes for 106 yards, and he won first-team all-conference honors. Koontz will have two seasons of eligibility to play at Pitt. From Jefferson Davis High School in Montgomery, Alabama, Mack chose Pitt over offers from Kentucky, Louisville, LSU, Memphis, Mississippi State, Ole Miss and Western Kentucky. The three-star recruit, according to 247Sports, played in six games last season, recording 29 tackles and five sacks. The 6-foot-4 player will join the team as the weak-side defensive end. The 5-foot-11 safety from Apopka, Florida, drew offers from 23 schools during his recruitment process. Considered a four-star prospect by ESPN and a three-star prospect by Rivals and 247Sports, Hill was a key player in the 12-2 run of the Wekiva Mustangs last season. The 6-foot-6 quarterback from Greenville joins the 2019 class as the only player from South Carolina. In his senior varsity season, Beville amassed 2,530 passing yards and 38 touchdowns. While completing 60.6 percent of his passes, he also ran 397 yards and five rushing touchdowns. Beville committed to Pitt over offers from schools including Yale, Northwestern and Cincinnati. As another three-star recruit, Nelms played both offense and defense at West Orange High School in New Jersey. His record of four quarterback hurries, 31 total tackles and one sack, benefits the Pitt defensive line. With offers from 16 schools, Pitt beat out ACC rivals Duke, Boston College, Syracuse, North Carolina and Virginia for Nelms. A third recruit from Florida, the 6-foot-2 defensive tackle from Miami Northwestern High School had offers from 18 other schools. As a captain on a high school football team that went 14-3-1, Kancey decided to continue his career with his fellow teammate Leslie Smith as Panthers. From Germantown, Maryland, defensive lineman Jules comes to Pitt as a three-star recruit according to 247Sports. The 6-foot-3 player received offers from 11 other schools after acting as a top player on the Northwest High School team that had a win-loss record of 9-3. Another Florida native, safety Khadry Jackson, had numerous roles during his time at the Windermere Preparatory School. On a team that went 10-1 Jackson did his part with memorable plays like a 75-yard kickoff return for a touchdown. On defense as a safety Jackson had 64 tackles, including four for a loss and one sack. As a wide receiver, he racked up 302 yards on 15 receptions. From a choice of 19 schools, Jackson’s pick of Pitt allows for more two-way playing on the field. Joining other recruits from Florida, Davis chose Pitt over offers from 17 other schools. The 5-foot-8 running back from Cardinal Gibbons High School amassed 942 total yards and 11 touchdowns during his junior season. Davis’ commitment to Pitt allows him to play alongside former teammate and 2018 Pitt commit Marquis Williams. 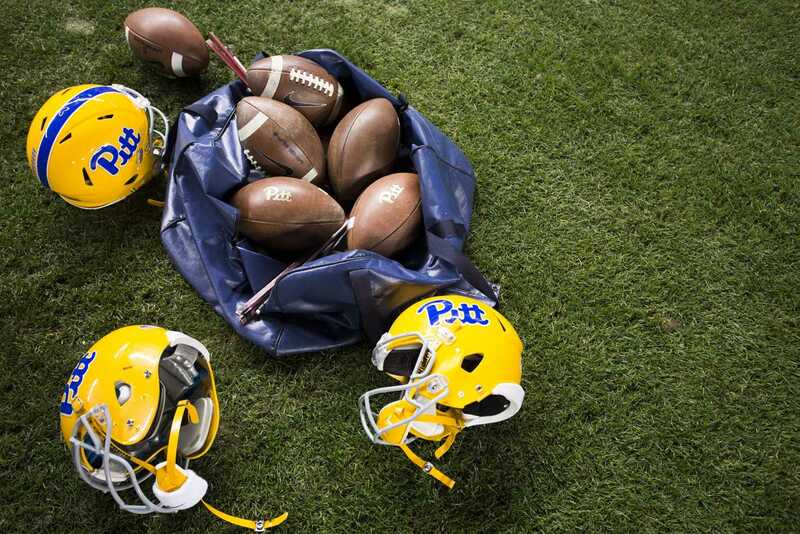 As the 26th player from a Pennsylvania high school to receive a scholarship offer from Pitt, George decided to accept Pitt’s offer over 17 other schools. Playing varsity for Berks Catholic High School in Reading since his freshman year, the 6-foot-3 two-way player has played in 40 games. On offense, George has accumulated 1,794 rushing yards and 28 touchdowns. As a linebacker, he has a total of 239 tackles, five interceptions and six-and-a-half sacks. Three-star prospect Bambanga Brima of Williamsport committed to Pitt June 19, a few days after his new teammates. With offers from a total of 15 schools, the 6-foot-7 defensive end comes to Pitt after a successful high school career at Loyalsock Township High School accumulating 77 total tackles and two sacks. Brima is the second in-state recruit of the 12 new commits next to linebacker Brandon George.